It is the responsibility of educators to utilize contemporary avenues in order to reach their students in ways familiar to them. When teaching digital natives, new techniques are necessary for making new information relevant to their experience. One way to do this is through the use of mobile devices in curricula. This integration can make education accessible anywhere and to anyone, personalized to each student's schedule and needs. 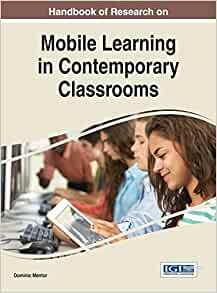 The Handbook of Research on Mobile Learning in Contemporary Classrooms expounds the current research on m-learning and strategies to leverage mobile devices in educational contexts. It also addresses the importance of communication, community, and mobility in modern classrooms, while offering a comprehensive overview of the theory and pedagogy associated with this new technology. Nonprofit organizers, K-12 educators, administrators, policy makers, students of education, and developers will find this book to be an important research companion. Dominic Mentor, Teachers College, Columbia University, USA. This is an eye opening book for both educators and students alike. I would recommend it to anyone who is interested in education, specially mobile education(mLearning). We all know how technology has contributed to the evolution of learning methods in academia. The access to knowledge is no longer inaccessible based on constraints location or social status and is available to anyone and everyone beyond limitations. The use of computer, iphones and other devices allowed information to reach beyond the historically privileged class. Professor Dominic literally goes "outside the box" to explain how these changes have affected they way we learn today and the progress that will change the way we learn in the future. The book underlines some challenges we face and recommendations to provide the best results. The book really shows how mobile learning can be an efficient tool to utilize a nation's greatest asset- a skilled workforce.